Are you looking for additional storage space? KOUSI Portable Wardrobe will meet all your needs. Features a large open space, leaving room for clothes to breathe. Made from steel and resin, it is light in weight and easy to clean. Not to mention, unlike fabric wardrobes, it won't degrade over time or collapse, nor will it get moldy or otherwise damaged by humidity, keeping your clothes fresh. 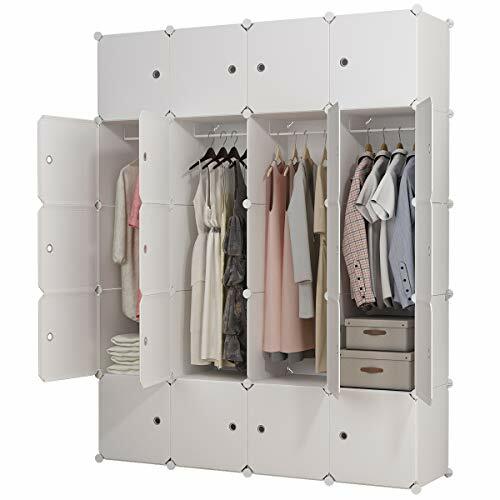 Color: - White Dimensions for each cube: - 14"(W) x 18"(D) x 14"(H) / 35cm(W) x 45cm(D) x 35cm(H) Dimensions for the whole unit(connectors included): - 58"(W) x 19"(D) x 71"(H) / 148cm(W) x 47cm(D) x 185cm(H) Dimensions for the package: - 19" x 15" x 10" / 47cm x 38cm x 26cm Shipping weight: - 36.6lbs / 16.6kgs Material type: - Resin sheet panels - Steel frame - ABS connectors Components: - Rectangular Panels (14"" x 18" / 35cm x 45cm): 36 pcs - Square Panels (14"" x 14" / 35cm x 35cm): 20 pcs - Square Doors (14" x 14" / 35cm x 35cm): 20 pcs - Weight-bearing panels (14"" x 18" / 35cm x 45cm): 5 pcs - Hanging Rail: 4 pcS - ABS connectors: 60 pcs - Hammer: 1 pc - Installation manual: 1 pc Announcements: - Please ask for the necessary quantity of each components if you plan to build a custom design. - Please stick each cube all the way inward to make it firm when installing. - We can only ship to physical addresses, we can not ship to P.O. Boxes. - Can not combine shipping. No international shipping. - The purchased item will be shipped within 2 business days. - Normally your purchased item will reach most places in the States within 2-7 working days. 【ELEGANT & SMART DESIGN】We made our closets with a sophisticated look and texture so that they can gracefully fit into your house. Measures in at 58''(W) x19''(D) x73''(H), suitable for dorms, apartments, garage and walk-in closets.